We discover that the trend of collecting chess sets has been developing among the collectors. The usage of chess might vary from one person to another. Chess as a game is played by man from various ages and gender. Chess as merchandise, display or interior center point is portrayed as art and precious collection. Moreover, our craftspeople develop the fashion set made exclusively to meet the demand of chess collectors around the globe. 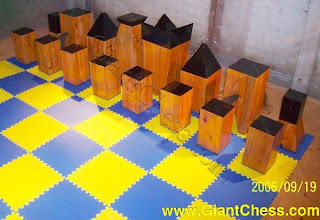 This customized chess is made of good quality of teak and beautifully crafted. The custom chess usually exhibits the cultural characteristics and historical moments. We deliver our skill to craft your custom chess in every details.